Entry fee: $40 for up to 5 images. Additional entries for $5 each. We want to see concert photos that capture the power and the glory of musical expression. But there is another side too: the backstage, offstage side of the musician. On the bus, car or train on the way to the gig. Navigating nightclubs, bars and concert halls. At rehearsals and studio sessions. Writing and alone time. Relaxing with friends, working the crowd or posing for the ever-present band photo. All these elements combine to create the musician’s life, whether pro, semi-pro or amateur. And this month at 1650 we want to see it all: Street buskers, one-man bands, classical quartets, rock gods, jazz legends, open-mic hopefuls, piano prodigies, church choirs, fat ladies singing and of course the roadies, fans and groupies, big time or small potatoes! 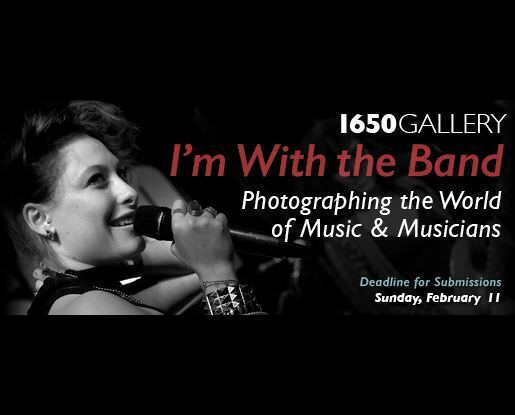 Approximately fifty works will be chosen from submitted photos to be included in the I’M WITH THE BAND group photography exhibition at 1650 Gallery in Los Angeles. Online submission of digital images via the website. All accepted entries must submit a high res jpeg (300-360 dpi, minimum size 5×7) to be included in the printed SHOW CATALOG.